The Erickson All-Stars: In Honor of Our Veterans! O happy day...It's another blog hop hosted by Operation Write Home to honor our Veteran's! Operation Write Home is a great organization that supports our nation’s armed forces by sending blank greeting cards to write home on, as well as cards of gratitude to encourage them. It's a great way to bless our service personnel for serving so selflessly for us. Here's the link to the beginning of the hop in case you missed it. Have fun! Now, continue on with the hop and check out the great cards by Celeste! My youngest "Any Hero" card maker showing his lovely creations. Funny how kids are so happy with a glue stick and paper! In addition to "hopping" today, I wanted to document one of my heroes...my dad. 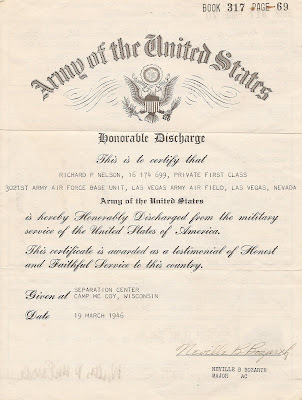 My dad served in the Army Air Corp for just 3 years in Las Vegas, NV. He never saw "action", but he is still a hero in my book. My dad passed away in 1997. He was a courageous and strong man with a huge amount of perseverance. 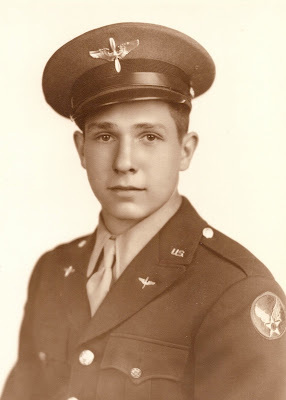 Honoring you, dad, on Veteran's day! Awww! Thanks for sharing YOUR hero with us...what a handsome guy!! Wonderful cards and awesome blog. 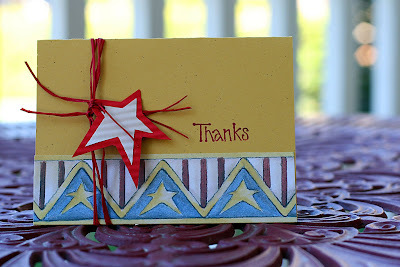 Love the blog.. your sons cards are so Cute Thanks for the hop! You do great cards! Love the AnyHero card maker! Thanks for sharing your story. Sorry for your loss. I'm sure he'll be missed. Hope you can join in the hop. those cards so so simple and sweet, love them! Your son looks so proud! Good job, Mama. Your cards look great! Beautiful cards - thank you (and your son) for sharing. Gorgeous cards! I love your style! Love your cards! (((hugs))) and comfort to you with your fathers passing. Sometimes the pain just doesn't go away for a long time, but the love lasts forever. Very nice blog! And such a neat photo of your dad. I lost my dad this year, I miss him dreadfully. We have a cool pic of him in uniform too, I should have posted it . . . neat pumpkin patch time with the kids too. Super sweet cards. I really love that your son is involved too! My son is helping me out as well. Such fun! your cards are so beautiful! keep you the good work! This is such a heartening venture. Here in Canada, the painting guild I belong to also creates and sends cards for our troops. 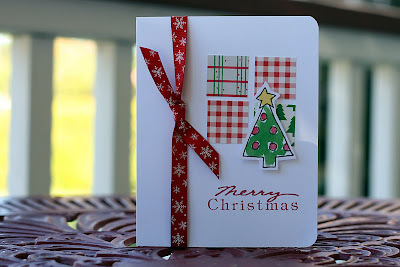 They range from painted, thru to stamped and embossed cards in every style imaginable and are received with great appreciation. It's such a little thing we can do for our heroes! Super cute cards! Thanks for supporting OWH! Fantastic cards! Tell your little guy he's created some awesome cards as well. My two boys (young men really) enjoy creating too. It's so great to see all this participation - really warms my heart! Thanks so much for sharing....we must remember all the sacrifices that have given us this life! BTW, cute pumpkin-y kiddos! Thanks for sharing! Your cards are so cute! And so are your kids! Awesome cards! What a wonderful crafty and supportive thing we can do for our troops! God bless them, and you! Great cards! What a handsome man your father was! Thanks! Thanks for the share so nice to have the military memorabilia and that awesome pic of your dad. So great. Thanks for sharing about your dad. 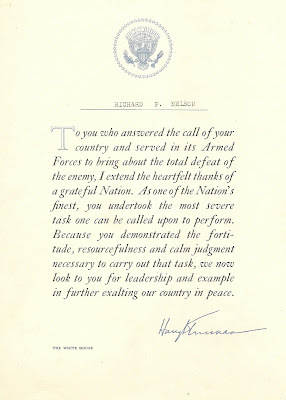 All who served are heroes. 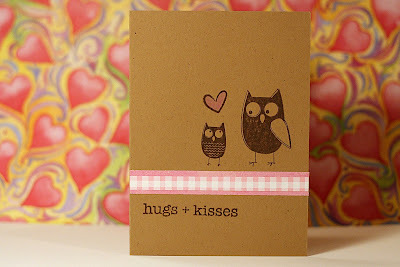 Your cards are great - the owls are so cute! I love that your little boy got into the act too. Thank you for sharing about your dad. Your Dad is a hero! Love your cards, and especially love that your kids are involved in this! What a wonderful tribute to your dad. 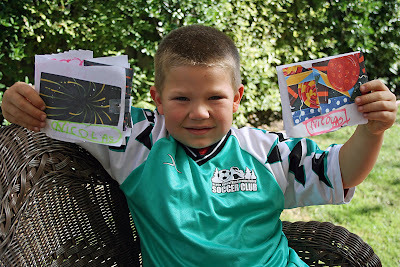 From the pictures, it's clear that your son has his smile (and your card making talent!). I love your cards, what a clean and simple style. Thanks for sharing in the hopping fun! Great pictures and great blog! Love your old pics, too! I'm a bit of a nostalgic sentimentalist, too! Great cards - and since I'm on the hop, too, it's like we are neighbors!!! BTW, I am wondering where you got the Mrs. Incredible Avatar/Pic under your profile? I have totally related to her since the moment we saw the movie with my kiddies! Can you send me a link? Thanks for sharing your cards!!! The dictionary is the only place where success comes before work. Hard work is price we must pay for success. I think you can accomplish anything if you are willing to pay the price. About the only problem with success is that it does not teach you how to deal with failure. *Reach* out. Take a *chance*. Get *hurt* even. But play as well as you can. Go team, go! Give me an L. Give me an I. Give me a V. Give me an E. L-I-V-E. LIVE! Otherwise, you got nothing to talk about in the locker room.